In April 1932, much of the countryside in England and Wales was closed off to the public and hundreds of people risked imprisonment to walk up Kinder Scout as part of a mass trespass to open up the countryside. Now in April 2012, we can all enjoy a walk across mountains or moorland but there are still many beautiful places which remain out of bounds – says Ramblers. On the 2nd April the Ramblers launched its Kinder 80 campaign to highlight the places in England and Wales we still can’t walk and the work the Ramblers is doing to open up and protect the countryside. 80 years after this landmark protest, the Ramblers has won the ‘right to roam’, helped to create National Parks and long distance trails but the journey to make Britain the most walker-friendly nation in the world isn’t over yet. From “missing links” in the iconic Thames Path National Trail, to a lack of access to the Nidderdale Area of Outstanding Natural Beauty in the Yorkshire Dales, there are swathes of beautiful scenery which are still out of reach of our walking feet. The Ramblers ‘Kinder 80’ interactive map shows these examples and many more, as well as the Ramblers continuing work to change this. Click here to discover more examples. The Ramblers is also calling on walkers and countryside lovers everywhere to get involved in a Kinder 80 ‘virtual’ mass trespass. Throughout April the charity is asking that walkers take pictures of blocked footpaths, broken bridges and areas which remain out-of-bounds to create a picture of the countryside which is waiting for walkers. “Since the mass trespass on Kinder Scout 80 years ago, people are now free to roam over large swathes of our countryside; we’ve helped to create National Parks, a properly recorded network of footpaths and in May we’ll see the launch of the Wales Coast Path – a world first. “But the journey those trespassers started is far from over. Our countryside combines rugged mountains and rolling fields, magical forests and meandering waterways and it is sad that not all of these scenic sites can be shared by everyone. 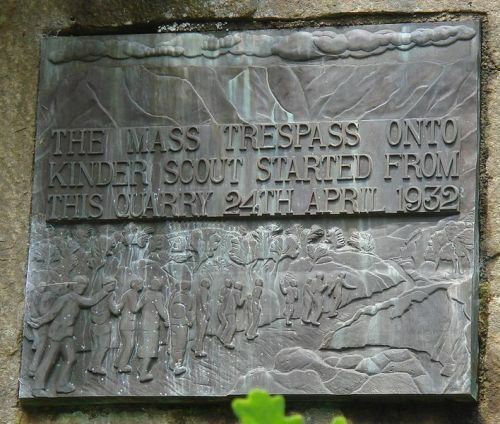 For more information on the history of the Kinder Scout mass trespass or on how to get involved go to www.ramblers.org.uk/kinder80 or follow #Kinder80 on twitter. Upload Kinder 80 ‘virtual’ trespass pictures to www.facebook.com/ramblers. This entry was posted in Miscellany on April 24, 2012 by Paul Scraton. ‘In the Mournes the landowners have tolerated access which has lead walkers to assume they have a right to walk, because they have always done so. This is known as “de-facto” access. Thanks Kevin and Dad for your comments. It seems amazing to me that 80 years on some of the same discussions are being had.